I was going through some records the other day and came across a newspaper article that I had kept about the murder of DEA Special Agent Enrique “Kiki” Camarena that happened in 1985. That year I was working as a criminal investigator with the Northern Virginia Regional Narcotics Enforcement Task Force. Working undercover in the states is risky enough, but when your assignment is working in a foreign country the risk increases tenfold, as was the case with Enrique Camarena. I remember how angry we were when we heard about Camarena’s horrible and brutal death at the hands of Mexican drug traffickers and corrupt police officials. I had friends who were DEA agents and remember that everyone wanted to get into Mexico and get whoever was involved, the Mexican government be damned. Enrique “Kiki” Camarena is an American hero and will always be remembered as such. His spirit lives on forever. For those Americans who were not born yet or were too young to remember what happened to Kiki Camarena, I hope by reading this article that you will have an understanding of what this man went through, his dedication for his job and the honor and bravery that he upheld right up to the time of his death. It has been over thirty years since Enrique Camarena was tortured and brutally murdered. His death is one story that should never be forgotten. Many questions still remain about his murder including was anyone else complicit in his death other than Mexican drug traffickers and corrupt Mexican officials? Was there involvement by those connected with U.S. intelligence and did national security overshadow drug enforcement operations and was that a motive for Camarena’s murder? The United States’ “War on Drugs” that has been ongoing for decades is actually anything but a real war, and one that we really haven’t been winning at all, despite the number of brave law enforcement men and women we have lost over the decades who were killed trying to stop this national cancer from destroying our country from within. Considering how many law enforcement lives have been lost and the toll in death and destruction of American lives that has occurred as a result of the illegal drug trade over the past decades, it is an American disgrace with seemingly no end. 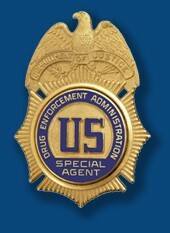 As federal, state and local law enforcement officers were on the front lines risking their lives, getting wounded and killed trying to stop the flow of illegal narcotics, factions of the United States government have been and some say still are in bed with those same criminals, the narco-traffickers that are the targets of those same law enforcement officers. Profits from drug trafficking provide a covert means of funding for all types of clandestine and other illegal operations throughout the world, that cannot legitimately be funded by governments in fear that they might be exposed if done through normal channels. The international drug trade is a trillion dollar plus industry that some financial experts have said that if the illegal drug trade was actually ever shut down the consequences could be the collapse of world banking systems and perhaps entire countries. Supply and demand plus corruption foster the drug trade. It could not exist without either. Mexican-born Enrique “Kiki” Camarena Salazar was a United States Marine, a firefighter and a police officer before he was sworn in as a special agent of the Drug Enforcement Administration in 1974. Camarena as with any other law enforcement officer who conducts narcotics investigations had just one goal, find the traffickers and shut down their operations. Camarena may have been the victim of the twisted alliances and misguided loyalties that sometimes rides a very thin line between law enforcement operations and the murky world of covert intelligence operations. All U.S. law enforcement agencies as well as the intelligence services suffer from interagency infighting. Whose case is more important than the other, what information should be shared and whose goals supersede those of another. What happens when one agency inadvertently stumbles into another’s operation, legal or illegal, or operatives go rogue and believe they may be above the law and free from any accountability? Does the end ever justify the means and was Enrique Camarena’s murder part of a much larger criminal conspiracy than we were led to believe. On November 7, 1984 based on information from Camarena, the Mexican military reluctantly destroyed between 5000-10,000 tons of marijuana on a 2,500 acre plantation called Rancho El Bufalo in the Mexican state of Chihuahua that had an estimated annual production of $2.5 billion. Rancho El Bufalo was an operation of Mexican drug lord, Rafael Caro Quintero, one of the founding members of the Guadalajara Cartel in the 1980’s, along with Miguel Angel Felix Gallardo and Ernesto Fonseca Carillo. Gallardo provided significant funding, weapons and other aid to the Contras in Nicaragua in the 1980’s. The Guadalajara Cartel was the most powerful Mexican drug-trafficking organization at the time and one of the first to work with the Columbian cocaine networks. Quintero’s drug operation with the Guadalajara Cartel were responsible for importing multi-tons of cocaine from South America through Mexico into the United States. On February 7, 1985 Enrique Camarena was abducted after he left the U.S. consulate in Guadalajara, Mexico. His abductors included officers of the Mexican intelligence/police agency at the time, the DFS. The Federal Security Directorate (DFS) was modeled after the American FBI and was partly created by the American CIA. The DFS also provided protection for Mexican drug cartel members, their drug shipments and smuggling operations. According to reports, after his abduction Camarena was taken to a ranch belonging to the cartel, where he was tortured for over 30 hours. Quintero and others crushed Camarena’s skull, nose, jaw and cheekbones with a tire iron, broke his ribs, tortured him with a cattle prod and drilled a hole in his head, among other things. A cartel doctor, Humberto Alvarez Machain, reportedly kept Camarena awake and alive with drugs during the torture. After Camarena was discovered missing and because of the lack of cooperation on Mexico’s part in finding Camarena, the United States Customs Service by request of the DEA initiated a crackdown on the Mexico-US border. For six days traffic along the entire 2,000 mile stretch of the border from Tijuana to Brownsville came to a snails crawl as agents inspected every vehicle at all of the 15 official border crossings. The Mexican government quickly got the message after the U.S. forced their hand to step up the search for Camarena as the crackdown on the border was affecting the Mexican economy. Within a week of the border crackdown, on March 5, 1985 Enrique Camarena’s partially decomposed body was found wrapped in plastic and buried in a shallow grave about 70 miles outside of Guadalajara, Mexico. Mexican officials were implicated in covering up Camarena’s murder and Mexican police were responsible for destroying evidence on Camarena’s body. Guadalajara Cartel founding members, Quintero, Carillo and Gallardo were the prime suspects in the kidnapping of Camarena. 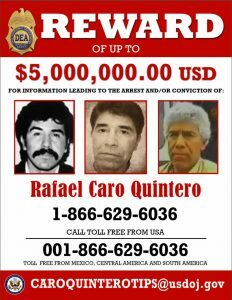 Rafael Caro Quintero was cornered in Mexico by DEA agents but the agents were forced at gunpoint by Mexican police to let him board a private plane where he pretty much gave the DEA an FU as he boarded the plane. Quintero was later captured in Costa Rica and returned to Mexico where he was convicted in Mexico and sentenced to 40 years in prison. Ernesto Fonseca Carillo was apprehended in Mexico, however Miguel Angel Felix Gallardo remained free in Mexico until he was finally convicted and sentenced in 1989. Carillo and Gallardo were sentenced to a Mexican prison. The cartel doctor, Humberto Alvarez Machain was captured in Mexico in 1990 by bounty hunters and secreted across the border into the United States. He was brought to trial in 1992, however a judge ruled there was insufficient evidence to support a guilty verdict so the charges were dropped. In 1992 four other defendants were convicted in a U.S. federal court. Javier Vasquez Velasco was convicted of murdering two American tourists in Guadalajara on the orders of druglords who mistook them for DEA agents; Juan Ramon Matta-Ballesteros, a Honduran drug trafficker who was the head of the SETCO airline that was used for smuggling narcotics into the United States; Juan Jose Bernabe Ramirez, a former Mexican policeman; and Ruben Zuno Arce, a wealthy Mexican businessman who was also son-in-law to former Mexican president, Luis Echeverria. On August 9, 2013 a Mexican federal court released Rafael Caro Quintero from prison after having served only 28 years of his 40 year sentence. This was a kick in the face to the memory of Kiki Camarena. Quintero was still wanted in the United States for the kidnapping and murder of Camarena and drug trafficking charges, however the Mexican government never notified the U.S. of his release and ignored an extradition request for Quintero. The U.S. currently has a $5 million reward for information leading to his arrest and/or conviction. For years after Camarena’s murder questions have been raised about the governments’ assertion that what happened to Camarena was nothing more than Mexican drug traffickers wanting to elicit information from Camarena about DEA operations, how much American law enforcement knew about their operations and who was cooperating with the DEA. After the release of Rafael Caro Quintero in October 2013 new revelations surfaced that if true could turn the story of Camarena’s death on its heels and put into question the official version that we were led to believe for years. Two former DEA agents, Phil Jordan and Hector Berrellez, and an ex-CIA contractor, Robert “Tosh” Plumlee spoke with Fox News in October 2013 and then other media and alleged that CIA operatives were involved in the kidnapping and murder of Camarena, because he had found out about the CIA’s clandestine drug activities in Mexico, and our own governments collaboration with drug traffickers who were importing tons of cocaine and marijuana into the United States. The profits from the illegal drugs were used to finance Nicaraguan Contra rebels who were attempting to overthrow Nicaragua’s Sandinista government. If all this sounds too familiar it was. The Iran Contra scandal in the 1980’s nearly brought down the Reagan White House and exposed the government’s illegal partnership with international drug traffickers. National Security Council aide, Lt. Col. Oliver North, who helped run the Contra war and other Reagan administration covert operations was center stage in that illegal operation. The subsequent congressional hearings on Iran Contra was nothing short of yet another national disgrace. Then we had the congressional report that was released in 1989 by the Subcommittee on Terrorism, Narcotics, and International Operations that was chaired by then Senator John Kerry. That report concluded that U.S. efforts to combat drug trafficking were undermined by the Reagan administration’s fear of jeopardizing its objectives in the Nicaraguan civil war and that the administration ignored evidence of drug trafficking by the Contras and continued to provide them with aid. According to the Kerry Subcommittee report, the airline SETCO, was the principal company used by the Contras in Honduras to transport ammunition and other supplies including personnel to one of the earliest Contra groups from 1983 through 1985. SETCO was funded by accounts set up by Oliver North. Because of the Iran Contra hearings and Kerry’s Subcommittee, thousands of documents became public over the years, many of which documented official U.S. knowledge of drug trafficking by the Contras. It was pretty clear then and now how Oliver North and others subverted their oath to defend the Constitution of the United States, abandoned domestic security for illegal foreign intervention abroad. The National Security Archive through a Freedom of Information Act lawsuit filed in 1989 obtained the hand-written notebooks of Oliver North, as well as declassified memos sent to North. They all indicate that Oliver North and other government officials were repeatedly informed of Contra ties to drug trafficking. The Washington Post reported in 1994, that there were no records to corroborate North’s later assertion that he passed this intelligence on drug trafficking to the U.S. Drug Enforcement Administration. On February 10, 1986 this liaison wrote to North regarding a plane being used to carry “humanitarian aid” to the Contras that was previously used to transport drugs. The plane belonged to the Miami-based company Vortex, which was run by Michael Palmer, then one of the largest marijuana traffickers in the United States. Despite Palmer’s long history of drug smuggling, which led to a Michigan indictment on drug charges, Palmer received over $300,000 from the Nicaraguan Humanitarian Aid Office (NHAO) – an office overseen by Oliver North, Assistant Secretary of State for Inter-American Affairs Elliott Abrams, and CIA officer Alan Fiers – to ferry supplies to the Contras. State Department contracts from February 1986 detail Palmer’s work to transport material to the Contras on behalf of the NHAO. 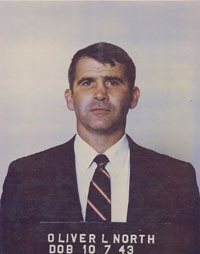 In July 1987 Oliver North was summoned to testify in hearings before a joint congressional committee that was formed to investigate Iran-Contra. North admitted that he had lied to Congress previously. North admitted shredding, altering and deleting government documents. North was indicted on 16 felony counts. On May 4, 1989 he was convicted of three: accepting an illegal gratuity, aiding and abetting in the obstruction of a congressional inquiry, and ordering the destruction of documents. He was sentenced to a three-year suspended prison term. On September 16, 1991 all charges against North were dismissed, based on that he was granted limited immunity during his congressional testimony. This may be ancient history to some, so what does all this have to do with Camarena’s murder? Well, at the same time that U.S. federal agents were working in foreign countries risking their lives to combat the international drug trade, and in Enrique Camarena’s case, he gave his life for that endeavor, we have CIA operatives, Pentagon officials and other government officials in bed with those same drug traffickers. The governments’ hypocrisy had no bounds. On one hand we had the DEA trying to combat the international drug trade and on the other hand Oliver North, the CIA and other U.S. officials were involved in an illegal covert operation that was in effect undermining the efforts of DEA agents. Who were these three men who spoke out in October 2013 and why should anyone believe what they have to say. An investigation is like a puzzle, you have to put all the pieces together before you can see the big picture and connect all the dots, and you always take into account your sources of information, what their background is and how credible they are. Retired senior DEA administrator Phil Jordan was the former head of the DEA’s El Paso Intelligence Center. Former DEA agent, Hector Berrellez took over the DEA investigation into the murder of Enrique Camarena that was then known as Operation Leyenda. Berrellez was a former homicide investigator and a seasoned undercover operative. Robert “Tosh” Plumlee is a former CIA contract pilot. When these three men started talking in 2013 headlines ran in various articles including; US intelligence assets in Mexico reportedly tied to murdered DEA agent. How Dogged L.A. DEA Agent Unraveled the CIA’s Alleged Role in the Murder of KiKi Camarena. Reagan administration, CIA complicit in DEA agent’s murder, say former insiders. Assassinated DEA Agent Kiki Camarena Fell in a CIA Operation Gone Awry, Say Law Enforcement Sources. And then what happened was you never heard anything else about their allegations again and it was pretty much never picked up by the mainstream media. What should have been a major story on every network, never happened, buried for a lack of a better word. And what about our elected officials, why did they remain mute on the subject? These are serious allegations that needed to be investigated about who else may have been complicit in the murder of a U.S. federal agent. Did Fox News stop pursuing the allegations because of Oliver North who is a Fox News contributor and the risk of opening up North’s old wounds? After all it was North’s Contra buddies who had imported tons of cocaine into the United States with his tacit approval and illegal operations. Maybe next time when Sean Hannity calls Oliver North a patriot somebody at Fox will have the balls to call North out on that. Oliver North and other government officials were also involved with Manuel Noriega for years, the former dictator of Panama, even though the U.S. knew for over a decade that Noriega was collaborating with Colombian drug traffickers and money launderers at the same time he was a U.S. intelligence asset. In 1988 a federal grand jury in Miami issued an indictment against Noriega for drug trafficking. According to the indictment, Noriega had allowed the Medillin Cartel in Colombia to launder money and build cocaine laboratories in Panama. When the U.S. invaded Panama Noriega eluded capture for 22 days. He sought asylum in the Vatican embassy before surrendering to DEA agents on January 3, 1990. He was brought to the U.S. where on July 10, 1992 he was convicted on eight counts of drug trafficking, money laundering and racketeering, and sentenced to 40 years in federal prison. According to the Kerry Subcommittee report Oliver North and other Reagan administration officials in 1986 interceded on behalf of Jose Bueso Rosa, a Honduran general who was heavily involved with the CIA’s Contra operations. Bueso Rosa faced trial for his role in a massive drug shipment to the United States, a $40 million cocaine shipment that was intercepted by the FBI in Florida. Berrellez said that when he brought the issue to the DEA at the time he was told by his supervisors to drop it and was ordered to stop pursuing any angle that suggested U.S. assets knew of Camarena’s capture. Tapes of Camarena’s torture and murder were eventually obtained. Berrellez said that he had two informants from the Mexican state police, who had witnessed Camarena’s torture, who independently and positively identified a photo of a Cuban male who was also present, who worked as a CIA operative and who was involved with running guns and drugs for the Contras. Also speaking to Fox News’ Bill La Jeunesse in October 2013 was Robert “Tosh” Plumlee who stated he was hired to fly covert missions on behalf of U.S. intelligence, claiming he flew C-130’s in and out of Rafael Caro Quintero’s ranch in Mexico to airports throughout Central America in the 1980’s. He said he flew for the SETCO airline. In December 2013 Tico Times reported that Phil Jordan told them that Kiki Camarena had discovered the arms-for-drugs operation with the Contras that was run by U.S. officials in the National Security Council and the CIA, and threatened to blow the whistle on the covert operation. According to Tico Times Tosh Plumlee stated that in the fall 1984 he had met with agents from the Phoenix Organized Crime Detail and the Arizona Tri-State Task Force, including Camarena, to discuss Plumlee’s SETCO flights. When Plumlee told the agents that the flights were sanctioned by the U.S. government, Kiki said, “That’s horseshit. You’re lining your pockets.” Kiki could not believe that the U.S. government could be running drugs into the United States. Plumlee said that he flew a C-130 transport plane in and out of Rafael Caro Quintero’s ranch in Veracruz, Mexico to Bogata and Medellin, Colombia, to Ilopango Air Base in El Salvador, and to a secret airstrip on the Santa Elena Peninsula in Costa Rica, among other locations, carrying arms south from the U.S. to the Contras and cocaine north to U.S. military installations, including El Toro Marine Air Base in southern California and Homestead Air Force Base in Florida. Plumlee estimated that he and three other pilots smuggled about 40 tons of cocaine into the United States in the operation. Hector Berellez said he’s convinced the drugs were taken from the airbases by traffickers with connections to the Contras and sold on the streets [in the United States]. What happened to Enrique “Kiki” Camarena was a national tragedy. Camarena died a brutal horrible death at the hands of Mexican drug traffickers and corrupt Mexican officials. And if we are to believe what Phil Jordan, Hector Berrellez and Robert Plumlee have told the media, CIA operatives may have also been complicit in his murder, which means that there are still others out there that need to be brought to justice, no matter who they are. Many have said over the years that Oliver North and others should have been indicted by a grand jury for criminal conspiracy in drug trafficking. That never happened. 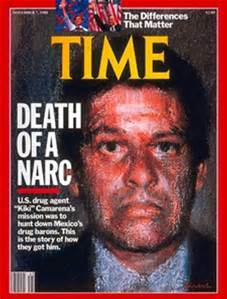 If Kiki Camarena was actually murdered because he uncovered officially sanctioned drug running by the U.S. government, well there is no statute of limitations on murder. This case needs to be reinvestigated by a competent federal authority and all parties with any knowledge brought before a federal grand jury to find out exactly what the truth is once and for all. In death Enrique “Kiki” Camarena deserves that much. Kiki was 37 years old at the time of his death in 1985. He was survived by his wife and three children. Kiki Camarena received numerous awards during his tenure with the DEA and posthumously received the Administrator’s Award of Honor, the highest award given by the DEA. His memory lives on in a yearly golf tournament in California that was named after him, the nationwide Red Ribbon Week that was established in his memory that teaches youth to avoid drug use and the Enrique S. Camarena Foundation that was founded in 2004 that is committed to drug and other violence prevention. He paid the ultimate price for combatting drug trafficking and he will never be forgotten.